Playground Equipment For Sale: 3 Reasons To Opt Into The Octopit! Let’s say you just moved into a nice, new house. It’s located in a great neighborhood, near great schools, and you finally have a big backyard in which your kids can play. Looking at all that empty lawn space, you might be tempted to start searching Craigslist for “playground equipment for sale.” After all, there are few things that encourage kids to spend time outside like an exciting set of playground equipment. However, we’d like to encourage you to put down the mouse and think about this decision for a minute. Is buying playground equipment for sale really the best choice for your growing family? We’d like to invite you to think outside the swingset-shaped box for a minute and consider investing in an Octopit instead! Here are just a few great reasons that parents all over the world are abandoning the quest to find “playground equipment for sale” and ordering an Octopit online instead! In order to install most playground equipment correctly, it must be anchored to the ground in a permanent fashion. This means digging substantial holes in your yard, filling them with concrete, and finding a way to lift the foundation of the playground equipment into them. Make a mistake during any part of this installation process, and you may just find yourself with an off-kilter swing set that requires a jackhammer to remove from your yard. Unlike most playground equipment for sale, the Octopit is designed to be both portable and collapsible. Cousins coming over for Thanksgiving? Set up the Octopit in the backyard and watch the young’uns go crazy for gaga ball! Need to rake up the leaves or mow the lawn? Simply disassemble the Octopit and put it into storage until the next time your kids want to play. Even if your playground equipment doesn’t have to be cemented into the ground, you better brush up on your engineering skills before you try to assemble it. Between poorly-written instructions, missing parts, and the frustration of trying to make Part A fit into Part C without the entire thing crumbling to the ground, it might be a few weeks before your kids can even enjoy their new playground equipment! On the flip side, the Octopit’s unique design snaps together for easy installation and takes approximately 15 minutes to set up! Swings, slides, and trampolines are pieces of playground equipment we all grew up with…and probably fell off of many times during childhood. If you’re looking for playground equipment for sale to install at a church, community center, or school, these liabilities might make your lawyer a little sweaty around the collar. Conversely, the Octopit is simple and safe! 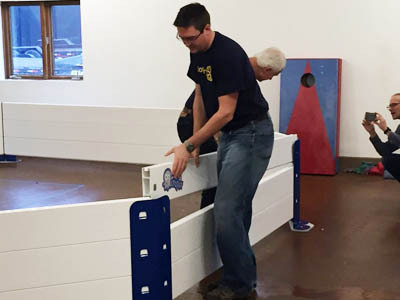 Made out of heavy steel and long-lasting polyvinyl, the gaga ball pit is completely free of fasteners, bolts, locks, and nails that might cause an injury risk for kids. Also, they can’t fall off of or get tangled up in the Octopit, making it even safer to enjoy a game of gaga ball with friends. What are you waiting for. Say goodbye to standard playground equipment and hello to the Octopit today!